Gently cleanses without overloading the untreated hair areas. Creates new bonds within the hair fibres. Helps to reinforce weakened areas in the hair structure. Helps to smooth and condition the porous areas of lightened hair. Leaves hair feeling supple and soft. Apply to wet hair and gently lather in a rich foam. 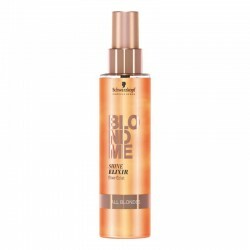 Condition or treat with your selected BLONDME product.